The artist [1903-1970]; his estate; consigned 1970 to (Marlborough Gallery, Inc., New York); transferred 1977 back to the artist's estate; transferred 1979 to The Mark Rothko Foundation, Inc., New York; gift 1986 to NGA. For a detailed discussion of the transactions surrounding the Rothko estate see Lee Seldes, Legacy of Mark Rothko, New York, 1978. Mark Rothko: The Spirit of Myth, Early Paintings from the 1930s and 1940s (NGA National Lending Service exhibition), Cedar Rapids Museum of Art, 1990-1991. Mark Rothko: The Spirit of Myth, Early Paintings from the 1930s and 1940s (NGA National Lending Service exhibition), Nassau County Museum of Art, Roslyn, New York, 1991. Mark Rothko: The Spirit of Myth, Early Paintings from the 1930s and 1940s (NGA National Lending Service exhibition), Telfair Academy of Arts and Sciences, Savannah, 1992. Mark Rothko: The Spirit of Myth, Early Paintings from the 1930s and 1940s (NGA National Lending Service exhibition), Art Musuem of South Texas, Corpus Christi, 1993. Mark Rothko: The Spirit of Myth, Early Paintings from the 1930s and 1940s (NGA National Lending Service exhibition), Payne Gallery, Moravian College, Bethlehem, PA, 1993. Mark Rothko: The Spirit of Myth, Early Paintings from the 1930s and 1940s (NGA National Lending Service exhibition), Salina Art Center, Kansas, 1993. Mark Rothko: The Spirit of Myth, Early Paintings from the 1930s and 1940s (NGA National Lending Service exhibition), Ball State University Museum of Art, Muncie, Indiana, 1994. Mark Rothko: The Spirit of Myth, Early Paintings from the 1930s and 1940s (NGA National Lending Service exhibition), Huntington Museum of Art, West Virginia, 1994. Mark Rothko: The Spirit of Myth, Early Paintings from the 1930s and 1940s (NGA National Lending Service exhibition), Marsh Gallery, University of Richmond, Virginia, 1994. Mark Rothko: The Spirit of Myth, Early Paintings from the 1930s and 1940s (NGA National Lending Service exhibition), Wallach Art Gallery, New York, NY, 1994. Mark Rothko: The Spirit of Myth, Early Paintings from the 1930s and 1940s (NGA National Lending Service exhibition), West Bend Gallery of Fine Arts, Wisconsin, 1994. Mark Rothko: The Spirit of Myth, Early Paintings from the 1930s and 1940s (NGA National Lending Service exhibition), San Diego Musuem of Art, 1995. Mark Rothko: The Spirit of Myth, Early Paintings from the 1930s and 1940s (NGA National Lending Service exhibition), University of Arizona Museum of Art, Tucson, 1995. Mark Rothko: The Spirit of Myth, Early Paintings from the 1930s and 1940s (NGA National Lending Service exhibition), Lore Degenstein Gallery, Selinsgrove, Pennsylvania, 1996. Mark Rothko: The Spirit of Myth, Early Paintings from the 1930s and 1940s (NGA National Lending Service exhibition), Palm Springs Desert Museum, California, 1996-1997. Mark Rothko: The Spirit of Myth, Early Paintings from the 1930s and 1940s (NGA National Lending Service exhibition), St. John's Museum of Art, Wilmington, North Carolina, 1996. Mark Rothko: The Spirit of Myth, Early Paintings from the 1930s and 1940s (NGA National Lending Service exhibition), The Smart Museum of Art, The University of Chicago, 1996. Mark Rothko: The Spirit of Myth, Early Paintings from the 1930s and 1940s (NGA National Lending Service exhibition), Hearst Art Gallery, Saint Mary's College of California, Moraga, 1997. Mark Rothko: The Spirit of Myth, Early Paintings from the 1930s and 1940s (NGA National Lending Service exhibition), Midland Center for the Arts, Michigan, 1997. Mark Rothko: The Spirit of Myth, Early Paintings from the 1930s and 1940s (NGA National Lending Service exhibition), Orange County Museum of Art, Newport Beach, California, 1997. 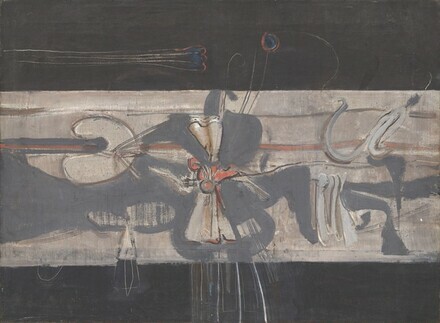 Mark Rothko: The Spirit of Myth, Early Paintings from the 1930s and 1940s (NGA National Lending Service exhibition), Sheldon Memorial Art Gallery, University of Nebraska, Lincoln, 1997. Mark Rothko: The Spirit of Myth, Early Paintings from the 1930s and 1940s (NGA National Lending Service exhibition), The Arkansas Arts Center, Little Rock, 1998. Extended loan for use by Secretary Michael Chertoff, U.S. Department of Homeland Security, Washington, D.C., 2006-2008. In the Tower: Mark Rothko, National Gallery of Art, Washington, D.C., 2010-2011, unnumbered brochure, fig. 7. American Paintings: An Illustrated Catalogue. National Gallery of Art, Washington, 1992: 303, repro. Anfam, David. Mark Rothko: The Works on Canvas: Catalogue Raisonné. New Haven and London, 1998: no. 273, repro.